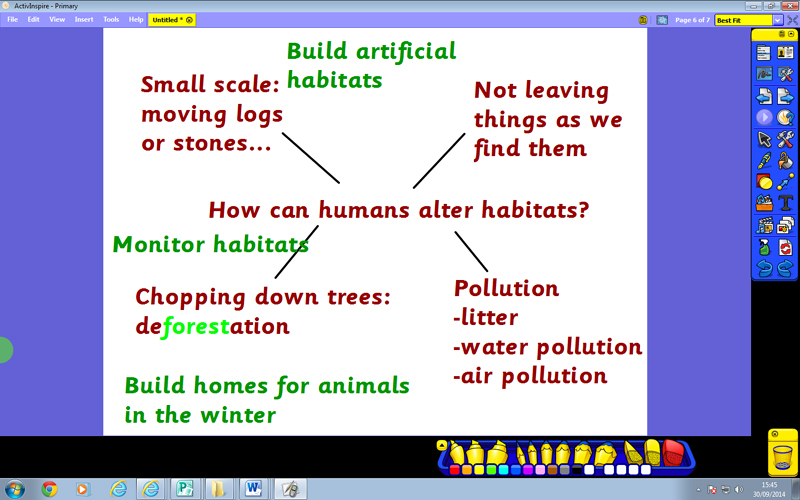 In our science lesson today we had an excellent discussion about the ways in which humans can change habitats. We recognised that sometimes these changes are good; for example when we help built shelters for them or plant extra trees and plants. 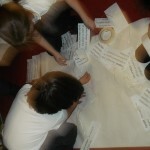 However, we also discussed how humans often have a negative impact on the environment. 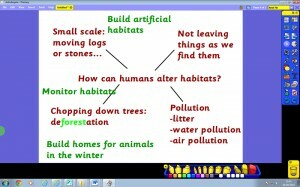 We learnt about deforestation. This happens when lots of trees are chopped down. 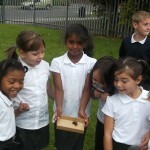 Keep an eye on this post and hopefully year 4 will tell you how this impacts different animals. 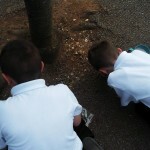 Then we Google’d the word pollution and were disgusted by some of the images we saw. We have decided to play our part keeping the environment the way it should be by helping the creatures that live in our school grounds by doing a litter pick next week. 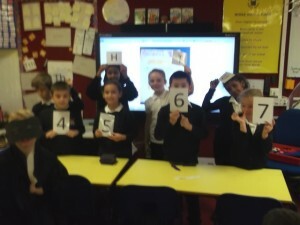 Our maths lesson was interrupted today by the evil villain, The Evil Takeaway! 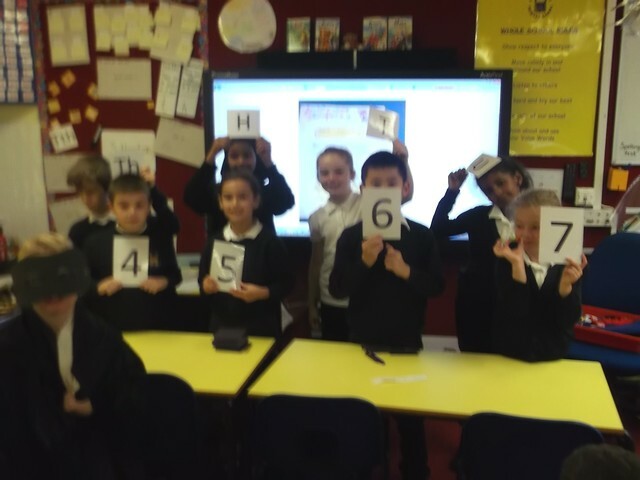 We set up our 4 digit number, 4567 using digit cards and diennes. Then, The Evil Takeaway barged in, masked and caped, and demanded 3874. ‘Ahh luckily I have 7 so you can have 4 and I will have 3 left over’ said Phoebe, relieved. This left the units column with 3. ‘Give me 7 tens now!’ shouted the Evil Takeaway. ‘But I only have 6! shreiked Jimmy! ‘Well you better find me some’ shouted the Evil Takeway in a fierce voice. Luckily, Isabel kindly gave the Jimmy 100 so that he could give the Evil Takeaway his 60. This left the tens column with 90. ‘Give me 800 now’ demanded the Evil Takeaway. 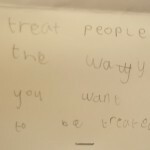 ‘I only have 500, Dylan, please help me’ pleaded Isabel. So, Dylan gave Isabel 1000, so she now had 1500 and was able to give The Evil Takeaway his 800. This left the hundreds column with 800. Finally, he visited the thousands column and demanded 3000. 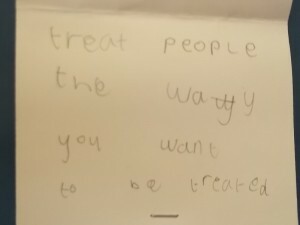 Luckily, that is exactly what Dylan had and so the Evil Takeaway went on his way. Can you work out how much this Evil mastermind got away with? 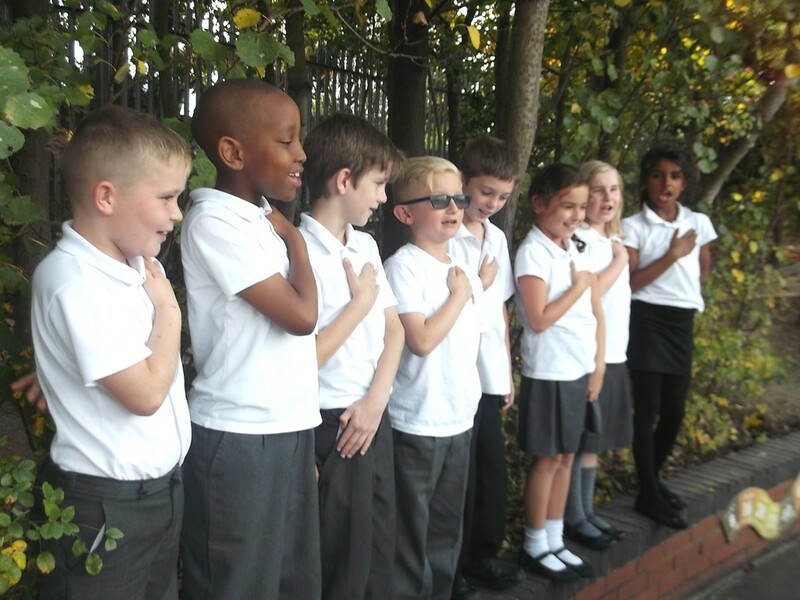 During our topic lesson this afternoon we harnessed our inner patriotism and sang the English National Anthem. 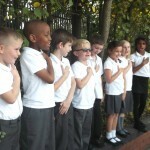 Before this, we worked on the I-pads to research the lyrics for the nation anthems of each of the countries in the UK. We have set ourselves the challenge to learn all of them before the end of our British topic. Can anyone help us with the Welsh amd Irish national anthems? We are finding the words very tricky to pronounce. 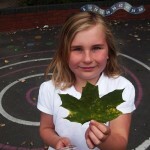 We have had an extremely busy week in Year 4 with lots of brilliant learning going on. We have been introduced to our class novel- The Railway Children- and have enjoyed reading it. 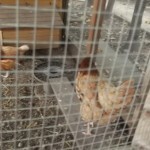 This has linked with our topic work in which we have been thinking about the differences between city and country life. We have empathised with the Railway Children and how hard it must have been to go from the riches of London life to ‘playing at being poor’ in a rat infested house in the middle of nowhere. 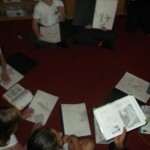 We cannot wait to read more of the story to see what the children get up to. 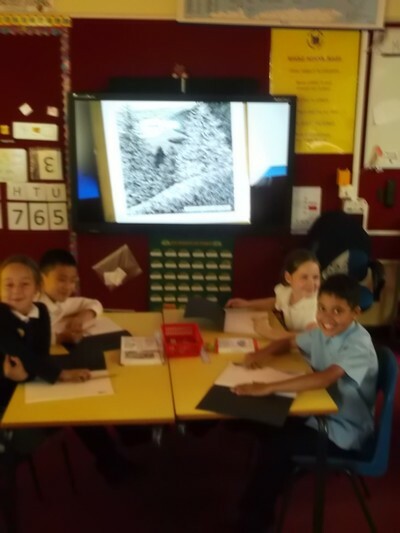 This week we also had our first French lesson with Mr Croser, practiced the tricky skill of column addition and tried to sell parts of the playground to mini beasts (copies of our work to follow). 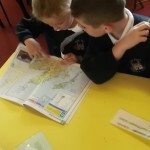 During our Geography lesson we looked at a map of the British Isles. 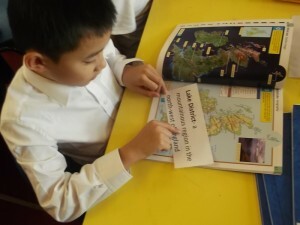 Each of us were given a label with the name of a different country, city or place. We used the atlases to locate these places so that we could add the labels to a map that will now go on display in our classroom. The hot topic of the Scottish vote to become an Independent country and we wondered whether if the vote is a ‘yes’, will Hardiens Wall be rebuilt? The Robins are looking forward to finding out the result of the vote on Friday and continuing on their learning journey about the United Kingdom. Where in the World… do we live? 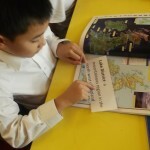 As part of our topic ‘Where in the world?’ we thought about where we live. 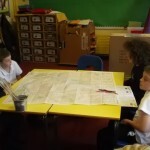 We looked at some Ordinance Survey Maps of Scotland and the Lake District. 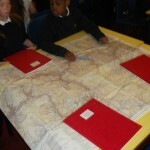 The key on the maps helped us to work out what all of the different symbols represent. We used these ideas to draw maps of where we live, thinking carefully about the birds eye view of our homes before we began. 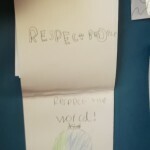 This morning during circle time we listened to the song ‘Respect’. 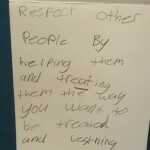 We discussed what it means to us and how we can show respect around school and at home. 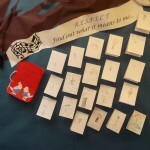 We came up with lots of lovely ideas about respecting each other, ourselves, property and our environment. 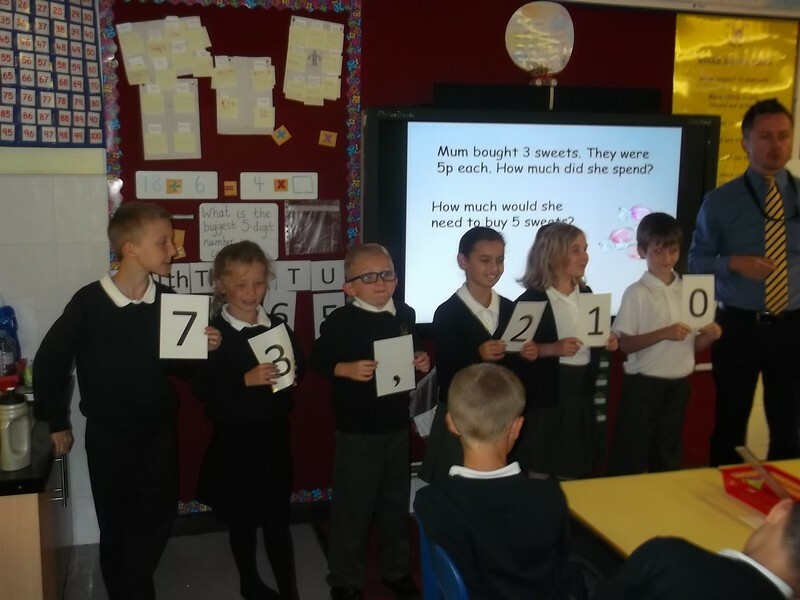 This week in Maths it has been all about place value. 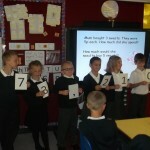 We have been introduced to the decimal point and have shown excellent understanding. 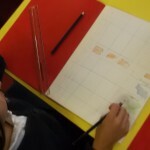 Over the past 2 days we have been multiplying and dividing numbers with decimals by 10. Volunteers came to the front to hold our digit cards, standing in the correct column. 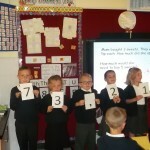 We used the tune of the Cha Cha slide to remind us what to do with the digits. 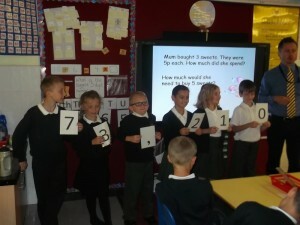 When we multiplied by 10 we moved at the digits a place to the left. 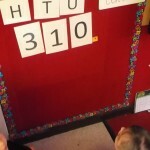 When we divided by 10 we moved all the digits a place to right right. 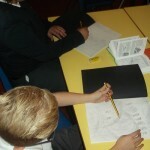 The children have all worked really hard with this very tricky new area of maths! 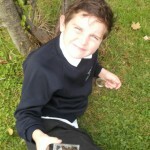 This afternoon we thought we would make the most of the beautiful weather and go outside. 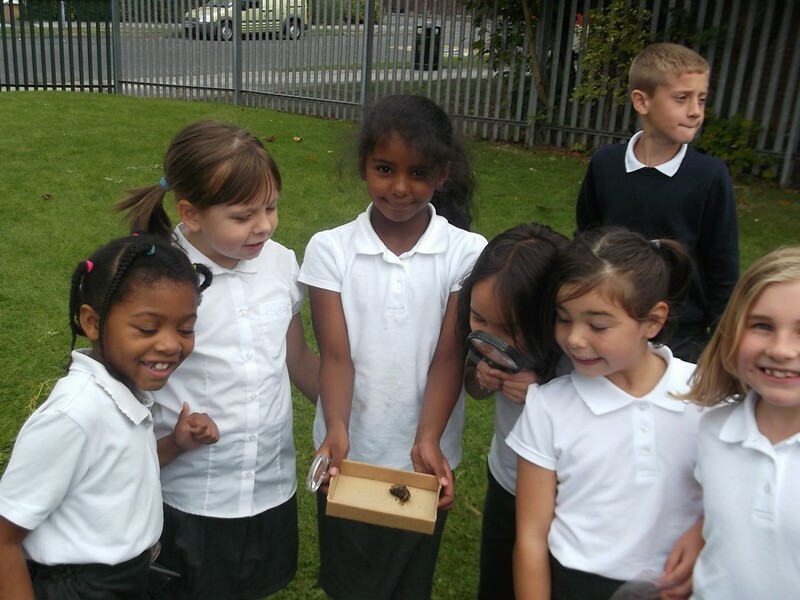 In science this term we will be learning about Living Things and their habitats. 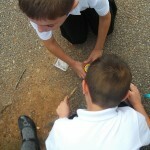 After establishing what a living thing is, we grabbed our magnifying glasses and went outside to do some biological detective work. Everybody found lots of living things including wood lice, ants, slugs, spider, chickens, trees, grass and flowers. We also gathered some examples to bring back to class for next weeks lesson. We were sure to only bring things that had already died like leaves that had fallen from the trees and sticks. 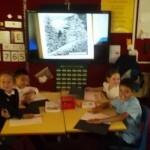 Next week, we will use the net books and information sheets to identify what we found. At the start of the day we decided it was going to be a Terrific Tuesday. We succeeded in this mission and had a wonderful day. After working hard in Maths and literacy in the morning, the children were lucky enough to have their first guitar lesson with Mr Gill. It sounds like they had a great time as adjectives used to describe it were ‘epic’, ‘awesome’ and ‘fun’. 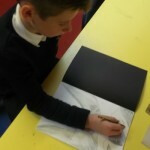 Whilst half of the class were developing their musical abilities with Mr Gill, the others spent some time practicing drawing. 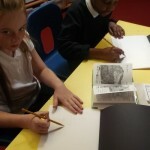 We were inspired by Alfred Wainwright’s pencil drawings. 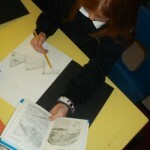 Miss Sloman demonstrated some drawing techniques on the visualiser (after Mr Baddhan showed her how to turn it on) including cross hatching, shading and using a rubber. The end results were wonderful. 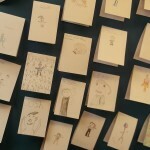 We all enjoyed sharing our drawings and everyone should be very proud of them.